Although little more than a takeaway place with a few basic tables, Gandhi Cuisine seems to be the place to be for rotis in Toronto judging by the comments around me as I ate. Set in a Bohemian part of town among tattoo parlours, bars, inexpensive restaurants and a mishmash of shops, Gandhis attracted a steady stream of students and travellers, and businessmen ringing their wives asking how hot the roti should be (they come in a choice of mild, medium or hot). More than one of these roti lovers proudly told their friend about the place’s reputation for good rotis. If you’re after value, you should know the rotis are huge (nearly everyone walked out with a leftovers box) and the most popular is the Butter chicken roti ($11.95 plus tax). Just what you wanted to know? My pleasure. Watching the chefs chopping and rolling away in the open kitchen, hearing the sizzle of the oil and breathing in that great smell of spice all adds to the nice buzz in Gandhis. So it seems rotis are good. But what of the other dishes. 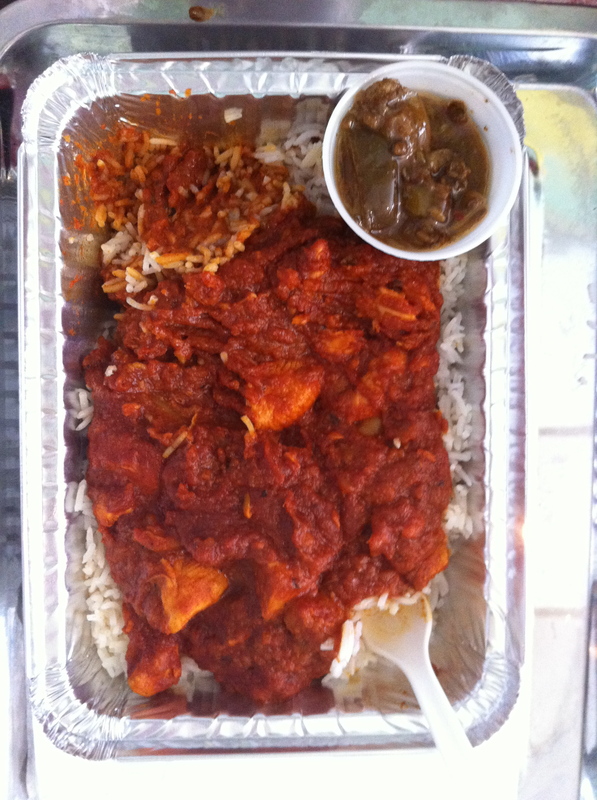 The menu is fairly limited but if you like it hot then go for the Chicken Vindaloo with rice ($11.95 plus tax) washed down with a can of cold Coke ($1.50). My request for a ‘hot’ version prompted raised eyebrows and a ‘are you sure?’ And I soon knew why. With its thick tomato base, this was seriously one of the hottest vindys I have ever tasted. Thank goodness for the large portion of plain rice and the sour mixed pickles. In line with the basic nature of the place, everything is served on a tray in a metallic container and must be eaten with a plastic fork. But this place is all about the food. And very good it is too. Gandhi Cuisine, 554 Queen Street West, Toronto, Canada. Tel: +1 416 504 8155.